Sri Lanka Tourism winning a multitude of awards globally this year at many a Global Travel Fairs in the back drop of the visitor arrivals crossing 830,051 at a growth of 14.1% in the first half of 2015 announced the 200 million EOI to search for a Top Global ad agency after a lapse of five years. As at now the Sri Lankan Tourism strategy has been essentially driven by a PUSH marketing strategy with multipronged initiative in key markets such as B2B road shows with the private sector, Visiting Journalist programmes, Travel Trade Fairs and high profile media interviews. Given the strengthened of Sri. Lanka Tourism. 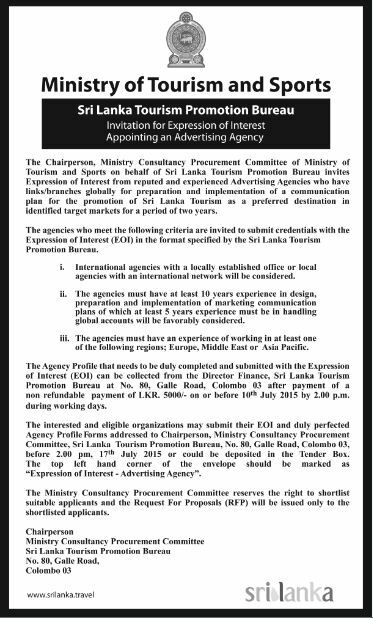 Promotions Bureau marketing team with 31 mid-career professionals which was selected purely on merit as per the government regulation, we are now ready to launch the aggressive multimedia campaign commented Chairman Sri Lanka Tourism Promotion Bureau Rohantha Athukorala. Whilst the formal private sector has been pushing for a above the line campaign the Chairman accepted that the PUSH strategy is not sufficient build a strong ' Tourism destination brand' but given the reality where we were dogged with financial irregularity and human resource constraints we had to first get the house in order before going global said Athukorala stating that we are yet to pay almost 3 million dollars for media advertising that had happened previously. I must thank the Ministry, Board of Directors and private sector stakeholders for the base level marketing plan that has been agreed upon after many consultations in the last 3 months. I am pleased to launch the EOI to begin the search for a Global Communication partner after a lapse of almost five years. Yes, we took time but we are doing it as per government procurement regulations. We not bend the rules due to market reassure voiced Athukorala. One of the key objectives of the strategic communication partner will be how the unique Sri Lankan Culture and people can be made aware via each of the countries diversified product portfolio said Athukorala. The logic being, the driver of tourism in a country is the heritage and culture and we were just communicating ' 8 wonderful experiences in 8 wonderful days" forgetting the DNA of the brand he said. “A traveller wants to experience the culture and its people through a country's product when they travel abroad. Not the latter in isolation. This is the challenge for a potential communication partner. Single- mindedly whilst accepting the fact that the USP of the country are - Diversity, Uniqueness and authenticity. This will never change technically” he said. A nine member high powered professionals will constitute the TEC committee, appointed by the Ministry and approved by the board which will be powered with strong governance and independence of decision making announced Chairman Athukorala. The Chairperson of the committee is the additional Secretary of the Ministry of a Tourism and Sports.